WHAT’S RIGHT WITH THE HOUSING MARKET? Oh my, the sky is falling! The first mistake these writers make is they are asking the wrong question. Of course housing is lagging the recovery because of the residual effects of the housing bust and financial crisis (this lag was predicted on this blog and elsewhere for years – it should not be a surprise). The correct question is: What’s right with housing? And there is plenty. 1) Existing home sales were down 7.5% year-over-year in March. Wait, isn’t that bad news? 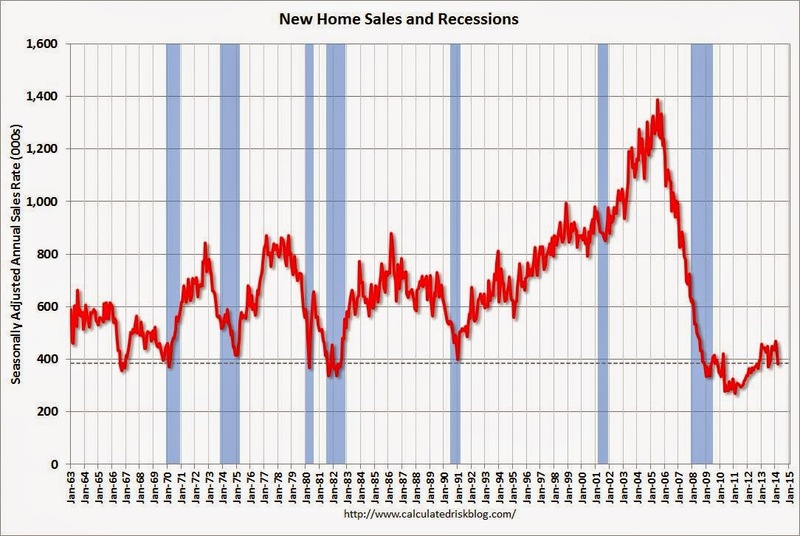 Nope – not if the decline is related to fewer distressed sales – and it is. (fewer foreclosures and short sales). 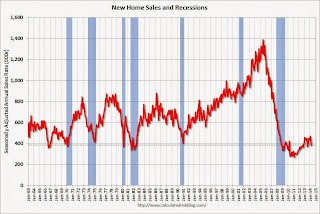 4) New home sales are up significantly from the bottom, but are still historically very low. There really is no where to go but up. A growing population will require more new homes. (I’ll post again on household formation in the future). The graph for housing starts looks similar. 6) The impact from rising mortgage rates is mostly behind us. Economists at Goldman Sachs have found “the effect of monetary policy shocks on [building] permits persists for 3-4 quarters”. Rates increased from around 3.5% in May 2013 to 4.4% in July 2013. Since then rates have moved sideways or down a little – and the “3-4 quarters” is almost over. 7) Existing home inventory is increasing, and house price increases are slowing. Sometimes rising inventory is a sign of trouble (I was pointing to this in 2005), but now inventory is so low that it is a positive that inventory is increasing. This will also slow house price increases (I think that will be a positive for housing too – a more normal market). 8) The MBA purchase index is skewed by large lenders. Over the last few years, small lenders (many not included in the MBA survey) have focused on purchase applications (they market through real estate channels and charge lower fees than the large lenders). Other data suggests mortgage applications are mostly flat year-over-year. 9) Investor buying is declining. Housing is a slow moving market – and the recovery will not be smooth or fast with all the residual problems. But overall housing is clearly improving and the outlook remains positive for the next few years.